Kat and I decided to switch for the day, so I’ll be talking about Classic Who costumes. There are so many great ones to choose from! When I really started to look closely at each outfit, I realized that they are not so different from one another. It’s basically variations on a suit (with a few exceptions, of course). First, I have two runners-up. Colin Baker’s Sixth Doctor costume is outlandish in the best way. I think it symbolizes the more alien side of the Doctor; he doesn’t quite blend in with humans. That’s okay, though, because he usually has more pressing things to worry about than fashion choices. Peter Davison as the Fifth Doctor gets points for the small details – orange trim on the jacket, embroidered question marks, and of course, the celery. My top two are the Fourth Doctor (Tom Baker) and the Seventh Doctor (Sylvester McCoy). Their costumes are actually very similar. Maybe I just like the “formula” that’s used for their outfits! Both of them consist of: plaid pants, vest, coat, tie, scarf, and hat. Also, they each have one knitted item. I’ve spent way too many hours researching the tiniest details of the Seventh Doctor’s outfit, since that’s the one and only cosplay I’ve done so far. I really like plaid and paisley, so I like all of the accessories. The vest is such a feat of knitting that I didn’t even consider attempting it. Also, plaid pants. Did I mention plaid pants? I’ve also spent many hours researching and knitting the Fourth Doctor’s scarf. So many people recognize the scarf, even if they’re not into Doctor Who. I love the scarf so much! It’s delightfully ridiculous. It sometimes gets in the way, but comes in handy on a number of occasions. The rest of the costume is great, too! I especially like the coat. In the end, I have to give this one to the Fourth Doctor. The scarf is just so iconic and the costume reflects the essence of Doctor Who – a little silly and a little serious all at the same time. Which Doctor has your favorite outfit? It’s the boots that perfect the look. 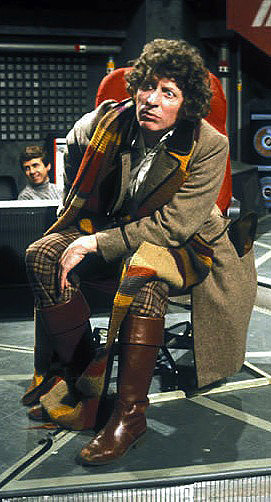 It’s stylish and even aristocratic, but still retains the Fourth Doctor’s signature bohemian style. You know, I haven’t seen that look. Those are some great boots!